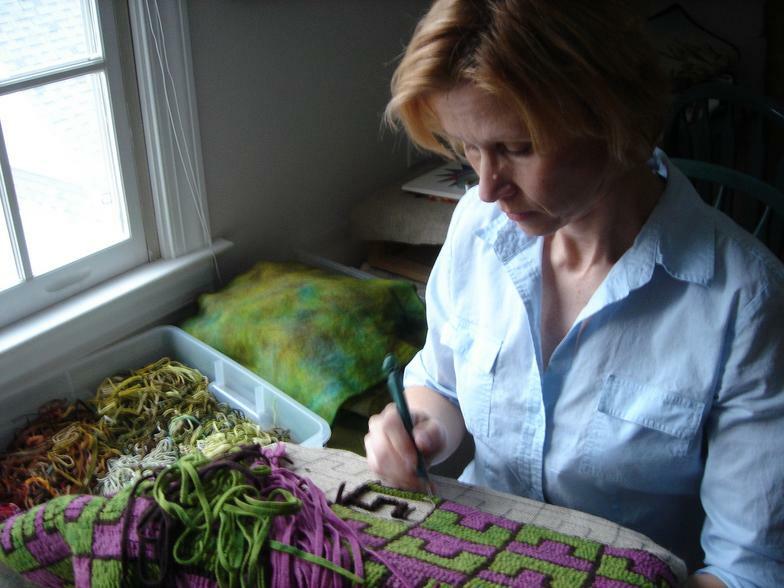 Karen has been creating works in wool using traditional rug hooking methods for over 30 years. Initially self- taught, she went on to study with well-known artists throughout the U.S. and Canada. In 1996 she pursued and received her teaching certificate from the National Guild of Pearl K. McGown Hookcrafters. Her favorite subjects are animals, landscapes and geometrics. She is a member of the Association of Traditional Hooking Artists, and has held the offices of Treasurer and President of her local chapter, the Piedmont Rug Hookers in Central North Carolina. She is an active teacher, teaching in her studio as well as at a variety of workshops. Piedmont Craftmen Guild based in Winston-Salem, North Carolina and the Carolina Designer Craftsmen Guild in Raleigh, NC . Her work has also has been juried into and exhibited at the American Craft Council show in Charlotte, NC.